What follows is a review of a 2011 reproduction of the collected works on Bartitsu, written by the art’s creator, E.W. Barton-Wright. This was a book I got round to reading as part of my ongoing investigations into martial arts subculture. I am currently in the process of writing a book on critical thinking martial arts subculture, “Bullshitsu and the Fight to Make Martial Arts Work”. I am sure you will see from my review, that despite E.W. Barton-Wright’s actual time spent teaching and promoting martial arts was quite short he forecast much of would occur in the subculture. Edward William Barton-Wright would have probably faded into obscurity like the majority of turn of the 20th century self-defence teachers if it hadn’t been for several factors. His writings were rediscovered by martial arts historians in the 1990s. This coincided with a time when the dormant methods of historical western martial artists were being investigated and reconstructed. Happening almost half a century after his death, these factors converged too far in the future for Barton-Wright to reap any of the fame or monetary gain. Nevertheless, work has been done to restore his reputation and place in history. This book is a collection of the articles written by the man himself for Pearson Magazine in 1899 and 1901 on his hybrid martial art of Bartitsu. As you might gather from the above paragraph, bartitsu (a portmanteau of his surname and jujitsu ) was not a commercial success. Indeed within two years of opening his Bartitsu academy in Shaftsbury Avenue in 1901 Barton-Wright seemed to cease teaching public lessons altogether and went on to pursue a peculiar type of physical therapy. However, some of the Japanese instructors he brought over helped promote bartitsu’s mother art of jujitsu and different schools of this art were being taught at the same time that Barton-Wright promoted his own brand. It was rumoured that Barton-Wright taught his art to some private students in the 1920s, however, there is no evidence to suggest that any of his pupils or fellow teachers continued to teach bartitsu. We can only conclude that his art did not survive as a living tradition. Hitherto the only source for Barton-Wright’s teachings in his art can be found within these articles. These articles are presented with a brief introduction to the entire book and a quote directly taken from the Sir Arthur Conan Doyle Sherlock Holmes short story entitled “The Adventure of the Empty House”, where the art is incorrectly spelled as “baritsu”. 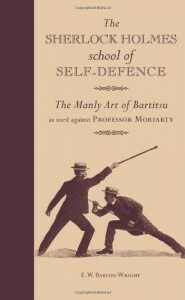 The promotion of this book relies heavily on this connection as can be seen in its whimsical title, “The Sherlock Holmes School of Self-Defence: The Manly Art of Bartitsu as used against Professor Moriarty”. This an intentionally pompous construction that would have been archaic even at the time when these articles were first published. The “Manly” part is clearly a wink at the rising Physical Culture movement that was burgeoning in 19th century Britain and was promoted with an overt masculine appeal. Bartitsu was almost certainly connected to this movement. Barton-Wright would abandon his martial art in favour of pursuing eccentric health care methods. It is significant that this particular book was published between the two Guy Richie/Lionel Wigram “Sherlock Holmes” movies, which drew more people to Bartitsu. However, the martial art mainly on display in the movies was more Wing Chun oriented and there was no serious effort made to reconstruct Bartitsu by the stunt team. This was due to actor Robert Downey Jnr’s personal interest in Wing Chun. However, this didn’t stop combat resurrectionists, self-defence researchers and martial arts historians from taking advantage of the world’s most famous fictional detective’s latest big budget incarnation and pitching articles in the media on what would become known as “The Martial Art of Sherlock Holmes”. Some articles are further decorated with a page dedicated to a passage from a Sherlock Holmes story that has a vague connection to the lesson that has been taught or about to be taught. This ranges from Holmes using verbal wits on an aggressive bully in “The Adventure of the Speckled Band” to his use of a hunting crop to disarm a gunman in “The Adventure of the Red-Headed League”. The book even ends with a portrait of Sir Arthur Conan Doyle, which is a bit like finishing a republished Japanese ninjutsu scroll with a photo of Ian Fleming. As pointed out in Nicholas Rennison’s excellent 2007 “biography” of Sherlock Holmes, “Sherlock Holmes: The Unauthorized Biography”, the reference to Bartitsu in “The Adventure of the Empty House” is an anachronism. Holmes returns from the dead in this story and tells Watson how he defeated Moriarty by sending his arch-nemesis tumbling from the Reichenbach Falls using this art, albeit misspelled. However, the events of the story come from “The Adventure of the Final Problem”, which is set in 1891 several years before Barton-Wright returned from Japan. Bartitsu had not yet been created. However, “The Empty House” was published in 1903 a couple of years after Barton-Wright had published his articles and set up his school in London. One cannot fault the effort the publishers have gone to present the pocket-sized book. It is a hard-backed with a contrasting fabric finish on its spine and has been printed quite lavishly on an expensive paper throughout by Ivy Press. Quite proudly the publishing team list six team members with a different production role as if they were part of a stage crew. The whole book feels more like an art project than a simple republication. I don’t like to fault the lavish efforts on display, but I would have preferred more effort being poured into a contemporary analysis of the material being presented and some annotated endnotes on the text. The book’s original literary contribution is a short, uncredited one and a half page introduction on Barton-Wright and a two page brief discussion Bartitsu in the UK. The material is accurate, to the best of my knowledge, and well-written, but it is too brief. By comparison Ben Miller’s book on the forgotten western martial artist and duellist Colonel Monstery not only contains the reproduction of his subjects articles– which had been out of print for over 113 years – but a detailed biography, discussion on the methods being taught and detailed end notes. All of this bound up in another hardback, pocket-sized and completely illustrated book. I would have liked to have seen this type of representation for Barton-Wright. Instead the late Victorian style of the writing and pictures clearly inspire the publishing team’s desire to accentuate what a 21st century reader might find amusing. This is mainly done using the notorious Victorian pointing hand icon, next to which you will find such quotes as “There is no social occurrence more distasteful than when a person, either by reason of inebriation or gracelessness, makes himself unpleasant at a gathering, particularly when there ARE LADIES PRESENT [publisher’s capitals]” and “Afterwards, when you have dealt with your adversary, it is entirely possible that you will find your CYCLE UNHARMED [publisher’s capitals] on the road-side”. Moving onto the actual content reproduced, unsurprisingly the publishing team do what publishing teams do best and lay out each article with a good selection of contemporary illustrations and photographs. Not all the pictures would have accompanied the text and several are photographs taken of ju jutsuka, dressed in gis and hakamas, performing the moves being described. There are photographs of suited individuals performing other moves and detailed illustrations of protagonists wearing straw boater hats and other attire that betray their era. Some of these images along with the wording can be seen as the clear predecessors for the stuffy-looking self-defence films of the 1930s and ‘40s, which Harry Enfield had so much fun sending up in his Chumney Warner sketches. Looking at the motivations and selling of Bartitsu, it is tempting to see the work as a prototype for the westernised Reality-Based Self-Defence movement that would become popular decades later. As the introduction points out, Barton-Wright’s audience were the middle classes who felt threatened by the increasingly sensationalised accounts of violent crimes. This is perfectly represented by title of the first article, “How to Deal with Undesirables” and the final subtitle of the last article, “A Direct Method of Defence when a Narrow Path is Blocked by a Ruffian”. In the first instance we have our suited gentleman martial artist ejecting an “undesirable visitor” from a room using a standing arm-lock. The final instance further exemplifies the time it was written and the author/teacher’s target audience. It is a sub-division of an article on defending one’s self whilst on a bicycle. The picture has the cyclist in the illustration propelling his body off the bicycle and crashing into his assailant. It all looks rather stiff and awkward, but the whole body move can also be found in Hatsumi Masaaki’s “Ninjutsu History and Tradition” albeit without the bike. This peculiarity might be connected to the fact that Hatsumi’s teacher and Barton-Wright trained in the same school of jujutsu, although it has been claimed that they studied at different branches of this now very obscure ryu. Again, the use of language throughout the book makes a clear moral distinction between the middleclass bartitsu user and his enemy, often described as a “ruffian”, an “undesirable” or a “footpad”. Bartitsu’s unarmed methods as presented in this book are taken wholly from Shinden Fudo Ryu jujutsu and Kano Jigaro’s Kodokan jujitsu (later popularised as Judo). It is worth noting that Kano was also a student of Shinden Fudo Ryu jujutsu and elements of it are in early judo, so it could be argued that the earlier art is bartitsu’s true ancestor. Nevertheless, other documentation reveals that British boxing, French savate and Swiss schwingen wrestling were also in the mix at his school. Reference to savate can be seen from a defending perspective when the author describes the possibility of dealing with kicks delivered by a “foot-boxer”. To Barton-Wrigtht’s credit, he offers respect to the ability of a savateur that was not regularly found by other 19th century British writers on self-defence. The unarmed techniques described are all done from standing or half-kneeling positions and nearly always end this way. The main techniques are arm-locks and some throws, but there are little of judo’s truly distinguishing features. Barton-Wright describes what might be called pressure-point techniques, found in many traditional ju jutsu styles, but there is no wishy washy pre-scientific justifications regarding attacking invisible energy channels. Although a good number of the techniques are simple and effective leverage methods, there is occasional reliance on pain compliance from a subdued assailant. Besides a single technique using a leg-lock there are no ground techniques. There are defences against strikes, but no actual strikes taught in the text or illustrations. Therefore, from the sum of Barton-Wright’s system of martial art, bartitsu, as presented by these articles could be described as purely grappling-based. However, going by what we know of the school, boxing and kicking techniques were taught. The weapon arts on display are mainly the European short stick or single cane styles that were popular at the time, being utilised through walking sticks and umbrellas. The author focuses a good deal of attention on the use of the stick and two article chapters are dedicated to them, including such variations as how to use a light stick against a heavier stick and how to use a hooked stick. Again, other evidence outside of this book reveals fencing as one of the other additional martial arts taught at Barton-Wright’s school. The article on bicycle defence demonstrates the author’s further interest in using improvised and incidental weaponry, which is another firm feature of the modern day RBSD movement. The sub-article that takes a lady’s perspective when defending from a bicycle position reveals a popular self-defence weapon at the time, that Barton-Wright describes as a “water squirt”. This device appears to be a water pistol of sort and according to the article they were readily available in bicycle shops of the time! The book offers another curiosity that seems to have become part of the modern martial artist’s DNA, the desire to show abstract physical tricks. The author does not make his intentions clear, but a charitable reader might assume that Barton-Wright taught these tricks to demonstrate how knowledge of body mechanics could overcome weight and brute strength if applied intelligently. A more cynical reader might assume that Barton-Wright was exhibiting these abstract feats to sell his art in the same way many traditional martial artists were adopting fakir tricks at the time as an attractive marketing device. The defence side of bartitsu is readily emphasised through the techniques shown. Only a few of the techniques demonstrate the user taking a pre-emptive position. In one instance, when using a light stick against a stout stick, the author feels he needs to explain why it is important to take the offensive. The prevalence of so many reactive techniques, particularly those describing what to do if someone does something, would dominate modern martial arts teaching. With only a few exceptions occurring prior to the 1990s – notably Jean Joseph-Renaud’s ”Le Defense dans la Rue”, John Styer’s “Cold Steel” and the articles of Dennis Martin and Gary Spiers – it would take the likes of Geoff Thompson, Peter Consterdine and other teachers popularised in their wake to demonstrate the importance of pre-emptive and proactive offensive self-defence. For the majority of the 20th century and still dominant in today’s martial arts world, students train with the assumption that they will be able to counter an initial assault. Yet, when put under pressure, serious assaults usually conclude with the person taking first physical action being the most successful. In this respect, Barton-Wright’s work resembles the approach taken by many teaching Brazilian jiu jitsu for self-defence and appears to be mainly targeted at mid-level violent encounters. There is nothing wrong in training for such instances. Indeed, they are more likely than serious violent attacks, but experience shows that it easier to scale down than scale up when it comes to training for a crisis. However, what is also missing in the text appears to be training methodology. At the time, the likes of Kano Jigaro were showing the importance of live training versus choreographed training. Another blueprint for 20th century self-defence culture can be seen in the way that articles are seen as problem solving techniques. This is very much in line with the reactive nature and would see the birth of scenario-based training. Martial arts self-defence demonstrations would often be marked by role-play scenarios of typical attacks whereby the defender would wait to be grabbed in some way or have a strike thrown at him before showing what to do. For decades to come martial arts students and instructors would be bothered by friends who wanted to know what to do if x, y or z happened. As a teacher, I am still plagued by the variety of hypothetical scenarios that are thrown at me when my main message has been to adopt a proactive mind. Nevertheless, Barton-Wright’s works put over a strong argument for realism in his age and based on the martial arts he had trained. It is written in the vein that the English gentleman or lady needed to wake up to the ugliness of violence. Barton-Wright felt compelled to have to tell his fellow countryman at the beginning of his first article that the rest of world did not train to fight in the same fashion as they did. They did not fight by the rules. They fought to survive. This was possibly addressing the love of boxing that had grown in England and the rest of the UK since the 18th century and had become adopted by all parts of society. Many an altercation could be traditionally solved with the two opponents “stepping outside” for a fair set-to. Rightly so, Barton-Wright saw this mentality juxtaposed against the mindset of a human predator that had no intention of playing by anyone’s rules. Given how little was written in the UK on the subject addressing these concerns (and what was seems alarmingly bad with British boxing coaches dismissing kicking and ground grappling as “un-English” even when faced with potentially life and death situations), Barton-Wright was certainly a pioneer in this respect. Again, we can see parallels in modern Reality-Based Self-Defence culture. Many self-defence teachers feel a need to distinguish the difference from their type of training, which addresses modern interpersonal violence, and other forms of combat activity that do not focus on this area but are more orientated towards sport, show performance, health, tradition and culture. From an historical perspective, Barton-Wright narrowly stands between two other self-defence teachers in the western world. Before him there was Monstery in the USA, who taught a wide range of western martial arts largely geared towards duelling and self-defence in the mid to late 19th century. After him there was Jospeph-Renaud who promoted cross-training and a realistic regard to self-defence in early 20th century France, examining and comparing different methods for the modern world. All three pioneers were drowned out by the tide of their times. Monstery – who had enjoyed a lot of success opening schools in the UK and earned himself a tremendous reputation as a duellist, a soldier and a self-defence teacher – became regarded as an eccentric out of his time. He taught boxing and fencing, along with various weapon arts, as a means for self-defence and they were all engulfed almost to the point of extinction by their sporting variations. After Barton-Wright, Joseph-Renuad’s one book that pre-empted just about everyone involved in martial arts cross-training and self-defence in the 20th century is virtually unheard of today. Of the three Barton-Wright’s contribution stands out as the one who crossed the widest land mass in his cross training education. He taught a Japanese martial art system alongside European methods, and addressed a failing he saw in the society of his home country. To judge bartitsu as a martial art from the text provided is not fair. We don’t have a enough data to get a good idea of how the art was trained within the melting pool of Barton-Wright’s school, where several teachers from different styles contributed. We can see there is a general sense of openness in the text, allowing for a “do whatever works” concept. The sum of the art is hard to distinguish beyond its desire to be applied in real life by the English gentry in self-defence. It is an eclectic system in the purest sense of the phrase – if that is not a contradiction of terms. There is no discussion on tradition, ceremony or ritual. For all its Victorian trappings, Barton-Wright is very pragmatic in the way he deals with violence. The book is an attractive product that is easy to transport and will endure. Sadly it is more of an art project than a scholarly review of the art, but this is not without its merit. As an item of interest related to the Sherlock Holmes franchise, it is a footnote at best. Bartitsu suffered from its own internal politics, which one assumes was part of the reason why it closed. We don’t know how the art evolved and was refined at the school much beyond these writings. No lineages have been verified back to the Barton-Wright and it can be considered to be an extinct style. It has been resurrected, as such, but this should not be confused with the continuation of a living tradition. The reproduction of Barton-Wright’s collected writings on bartitsu is worthy of a place in the collection of anyone who has a genuine interest in the history self-defence culture in Britain.